Justin Bieber’s latest action has caused online anger after he wrote a “tasteless” comment in the guestbook at the Anne Frank House in Amsterdam. Justin Bieber – who is currently on tour in Europe – visited the famous home where Jewish wartime diarist Anne Frank and her family hid from Nazi persecution for two years during the Holocaust. After spending an hour touring the home on Saturday, which opened as a museum in 1960, Justin Bieber wrote a message in the guestbook, which read: “Truly inspiring to be able to come here. 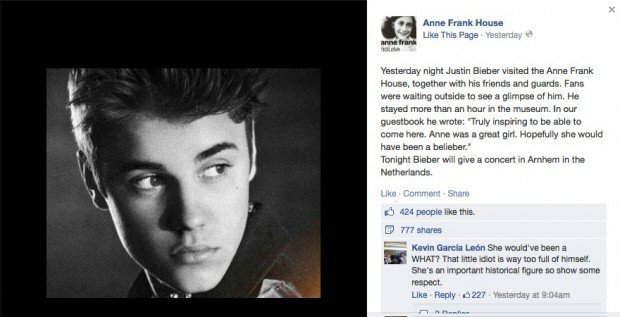 The Anne Frank House staff-run Facebook page shared Justin Bieber’s comments. Since the museum updated its page with Justin Bieber’s words, the Facebook post has garnered hundreds of comments expressing dismay over the young pop sensation’s presumptuous remarks. Many described it as “disrespectful”, “disgusting” and an “embarrassment to Canadians”. Hundreds of people took to Twitter to express outrage, branding Justin Bieber a “moron” and “douche”, leaving several to question whether he actually wrote such a shocking message. Anne Frank wrote her now-famous diary while residing in the house, with the teenager describing it as luxurious compared to other hiding places she had heard about. The Frank family moved to Amsterdam from German in 1933 – the same year the Nazis gained control over Germany. By 1940 the Nazi occupied the Netherlands, leaving the family trapped in Amsterdam. In 1942 the family went into hiding in the hidden rooms of Otto Frank’s office building, as persecution of the Jewish population increased under the Nazi regime. After two years the group were anonymously betrayed and were sent to their deaths at the Bergen-Belsen concentration camp, where Anne Franck died of typhus in 1945. Otto Frank, Anne’s father, returned to Amsterdam after the war and discovered her diary had been saved. It was published in 1947, leading to her posthumous fame.